The 28-year-old put pen to paper on a deal that will keep him at the Amex Stadium until the end of the 2019/20 season. 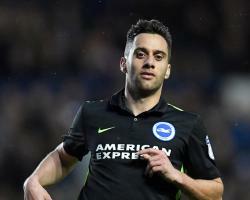 Baldock played an integral role in the Seagulls' promotion-winning campaign, scoring 12 goals last season as Brighton secured Premier League status for the first time in the club's history. "As soon as the club made noises that they wanted to extend my contract it was always in my head that this is where I want to be," Baldock told the club's official website. "Last season was probably the pinnacle of my career, and I hope now we can establish ourselves in the Premier League and continue to improve together." He has been a key member of the squad since he arrived at the club and this new contract is recognition of his contribution over the last couple of seasons. "He's also a great professional and a good character in the dressing room, so we are pleased he will be with us for the next few seasons."